Few politicians have fascinated the American people as much as Abraham Lincoln. The 1990s witnessed heightened interest in the sixteenth president and a flood of books about him that continues to the present. A recent tally indicates that at least 14,000 books and pamphlets have been written about him. The last guide to the best Lincoln books was produced in 1946. Since then several thousand more … titles have been published. As a result, anyone interested in reading about him faces a daunting task in seeking out the books that offer the keenest insights into the man and the legend and lore that surround him. 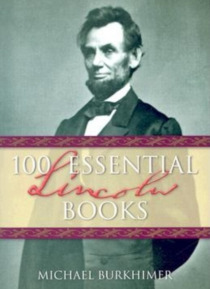 Michael Burkhimer's "e;100 Essential Lincoln Books offers a guide to this vast body of Lincoln literature. He chooses books that are indispensable for both book collectors and readers intent on learning more about Lincoln. The importance of each work is outlined with an emphasis on how it has contributed to Lincoln studies. Burkhimer's criteria for selection are based on the book's originality, sources, interpretations, writing style, and overall contribution. Titles are arranged chronologically in order of their first publication, ranging from 1866 (Francis B. Carpenter's "e;Six Months at the While House with Abraham Lincoln) to 2002 (William Lee Miller's "e;Lincoln's Virtues). The recent resurgence of interest in Lincoln is reflected in that almost one-third of the books described here have appeared since 1990. To further aid the curious Lincoln reader, each title is classified under a general heading, such as assassination, biography, family and genealogy, and reminiscences. Indexes of authors and headings are also included.